BH Designs: Sales and Christmassy Things!! Oh my,, how long has it been since I last posted on here? I am such a bad bad blogger. Well to be hinest I'm pretty rubbish at most things like this,, marketing!! Even though I use Facebook, a lot, I use it mainly to keep in touch with friends and family, so posting new products and sales is something I never seem to find the time for. I'd much rather be designing and creating things than posting about them. But sadly even that is something I haven't been able to find the time for lately. Oh I do have things in the works, always have,, but health, a new computer, and well just life stuff popping up have all had to take priority in the last few months. So, I hope you can find something in my store to grab in this awesome sale? It includes everything: Commercial Use as well, so please do go and have a look. And I promise, new stuff is just around the corner! This sale is on right NOW, click the image to visit my store! 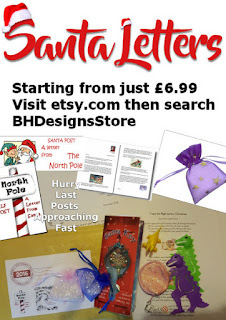 And,, time is running short to get your orders in for Santa Post, I like letters to go out no later than the 2nd week in December, so there is still a little time to out things right if they get lost or anything. Christmas Post is always crazy and I would hate for any children to be disappointed. Visit my Etsy store to see what's on offfer there. I have a 20% off sale running right now for Black Friday, purchase just 2 items to quaify for your discount. Labels: e-Scape & Scrap, Etsy, Sale!